Find Better Ideas, Faster ® with a custom USB trend report, our PRO Dashboard and 80+ categories of premium trend reports. The USB Trend Report collects crowd-sourced data on an array of features like security, storage space and attractiveness in product designs of USB ports, sticks and cables. The report looks at innovations in devices that use USB ports and cables to connect and communicate between electronics. It also provides examples of attractive USB sticks that are integrated into clothing, jewelry or other accessories. This is an ideal resource for industrial designers of electronic products who make media devices, computers, smartphones or even wearable technology. It provides a view into the top types of devices and their designs that appeal to consumers for charging, storage and portability functionalities. 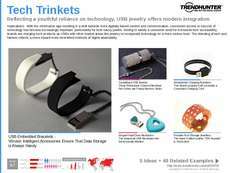 This USB Trend Report showcases the functions, purposes and designs of innovative USB sticks, cables and devices for electronic devices in the media, computer and audio industries.